Dr. Jeshuran has devoted his career to providing comprehensive quality spine care to patients. He believes in one simple truth: treat every patient like a family member. He believes that every patient is unique and deserves a customized spine plan from a physician that takes their time with them. Dr. Jeshuran is board certified with the American Board of Orthopedic Surgeons and a certified Fellow of Spine Surgery. Dr. Jeshuran specializes in the treatment of neck and back pain non-surgically and surgically. Spinal conditions include, degenerative disease, spinal deformity, and spinal trauma. He offers minimally invasive surgery, mobility sparing disc replacement surgery and alternative treatments for spinal aliments. Dr. Jeshuran received his undergraduate degree in Biology with a concentration on molecular genetics from the University of Pennsylvania. He was awarded his medical degree from Columbia University College of Physicians and Surgeons located in New York, New York and completed his orthopedic residency at Albany Medical, located in Albany, New York. Dr. Jeshuran then completed a spine fellowship at Johns Hopkins University located in Baltimore, Maryland. There he was a spine fellow and an associate professor of orthopedic surgery. He learned the latest innovations in minimally invasive surgery, artificial disc replacement surgery, motion preservation surgery, and treatments for degenerative conditions. Dr. Jeshuran has published many research papers in his career and continues to learn and stay up to date with the latest in spine surgery. He is a member of the American Academy of Orthopedic Surgery(AAOS), North American Spine Society (NASS), and Georgia Orthopedic Society. 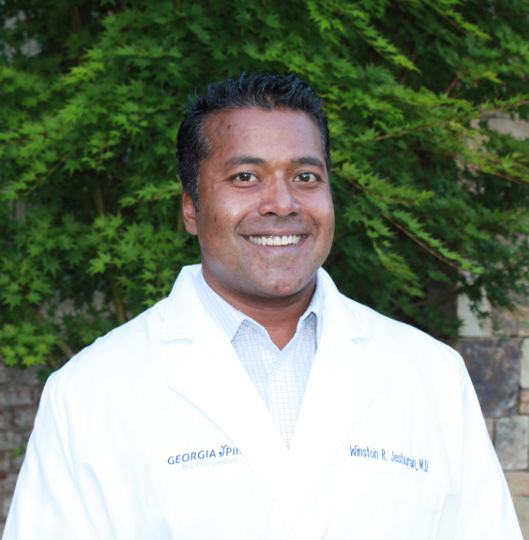 Dr. Jeshuran practices in Macon and Warner Robins, and is affiliated with Navicent Health and Coliseum Medical Center. Dr. Jeshuran is married with three children. He enjoys spending time with his family, fishing, hunting, and working on cars.